A light, but creamy soup with a delicate flavor. Comfort food without the calories. This Simple Irish Cauliflower Soup is made from just 3 ingredients, and is free from cream and flour. With an approaching spring, we might be more inclined to look for recipes that are a little lighter, but we still need a certain degree of comfort food. This recipe, with only 3 ingredients, fulfills that promise easily. I have to admit, that I was a little surprised that this soup tasted this good. Cauliflower and potato don’t rank on the top of the list of flavor providers and just cooking them in boiling water does not add much flavor either. But blending them together and add a little bit of cheese is just enough to let the delicate flavor of the cauliflower shine. This is what you need to do; cook the cauliflower and the potato in a little bit of water. Like 1-1.5 inch in the pot. At the end of the cooking time, drain, but reserve that cooking liquid. This liquid does not only contains flavor, it also contains all the vitamins, so you don’t want to throw that out. Don’t use too much water, you’ll end up with a very thin soup without flavor. Adding the cooking liquid back into the soup will not be enough to call it soup; you’ll need to add vegetable stock or chicken stock if you prefer. Once you have your preferred thickness add the cheese. I grated Kerrygold Swiss Cheese, that’s not too sharp, but does have flavor. 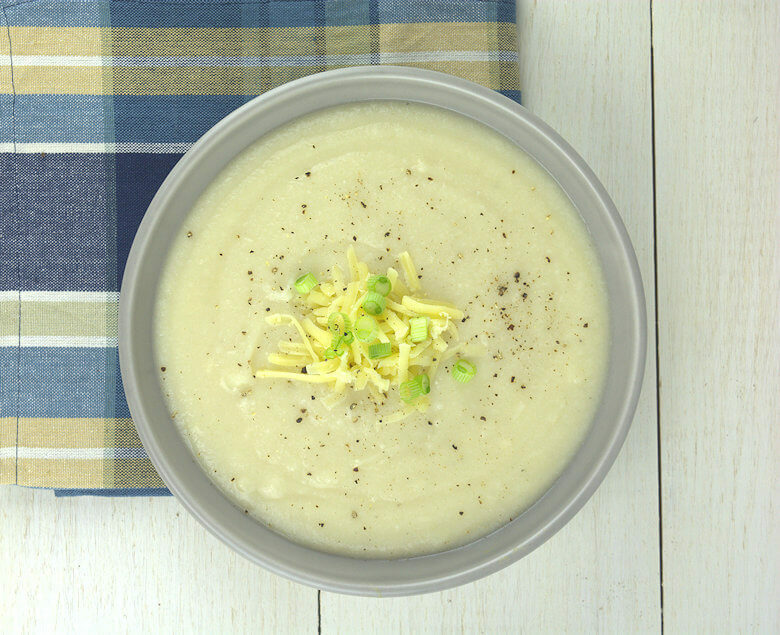 Cooked cauliflower has a delicate flavor, so adding a sharp cheese, would overpower the flavor of Simple Irish Cauliflower Soup entirely. Add salt and pepper to taste. At the end garnish with some grated cheese and finely chopped spring onions. 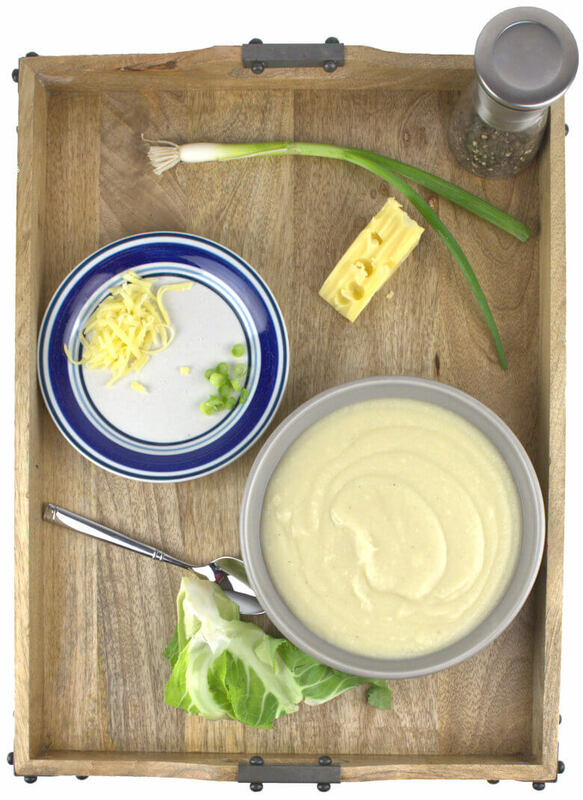 This Simple Irish Cauliflower Soup is vegetarian, and gluten free. A light, but creamy soup with a lot of flavor. Comfort food without the calories. 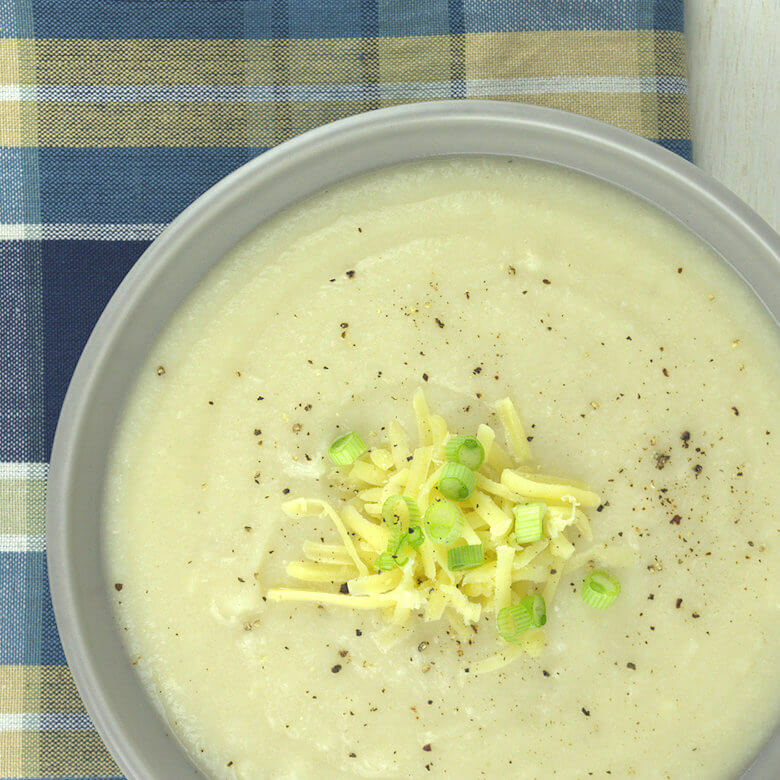 This Simple Irish Cauliflower Soup is made from just 3 ingredients, is free from cream and feels like liquid velvet in your mouth. Clean the cauliflower and peel the potato. Separate cauliflower in small florets and cut potatoes in cubes. Transfer cauliflower and potato to a large pot, add an inch of water and some salt and cook until vegetable and potato are tender. This is about 15-20 minutes. Drain, but keep the liquid; you will need it again. Transfer the vegetables to a blender and pulse until smooth or use an immersion blender and work inside the pot. Add the cooking liquid back into the mix and add vegetable stock until you reach the thickness you prefer. Add the grated cheese and stir until melted. Add more stock if needed. If you want more flavor to the soup, try to roast the cauliflower in the oven, instead of cooking in water. If you want more crunch. Add some tiny florets of raw cauliflower or sprinkle with some crisp bacon. This recipe can easily be for 2 people; two bowls for now and 2 for the freezer.